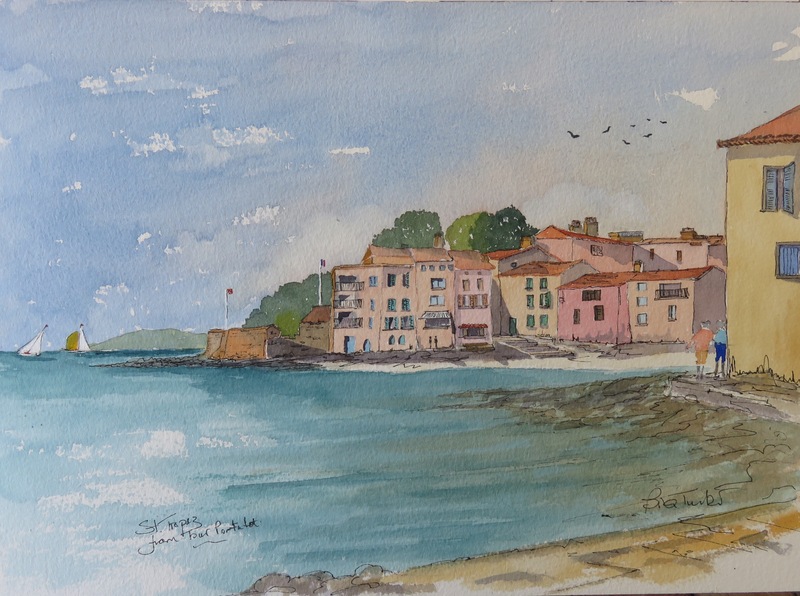 Painting in the South of France is such a delight! We had been in Normandy recently but last week we were back in Provence staying on the Cote d’Azur. The weather was spectacular, hot as the middle of summer, the skies blue, and the sea a shimmering Azur. So time for some painting! 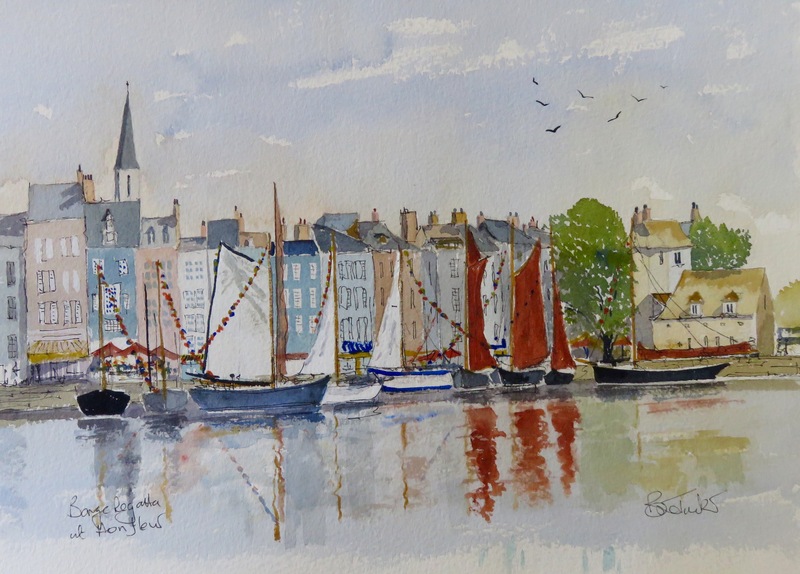 I wanted to finish a sketch of Honfleur I had started in Normandy but with a Regatta theme. 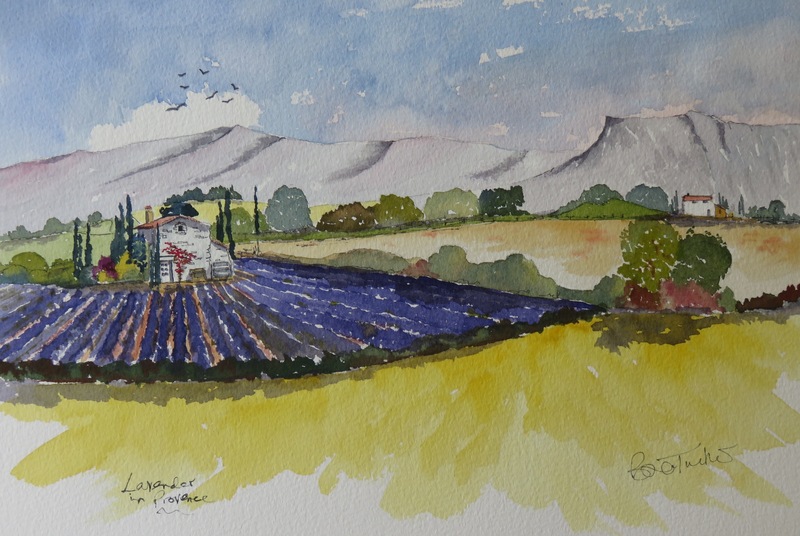 Painting watercolours in the lovely heat of Provence means working very quickly as the watercolours dry so quickly! Watercolour 14 inches by 10. 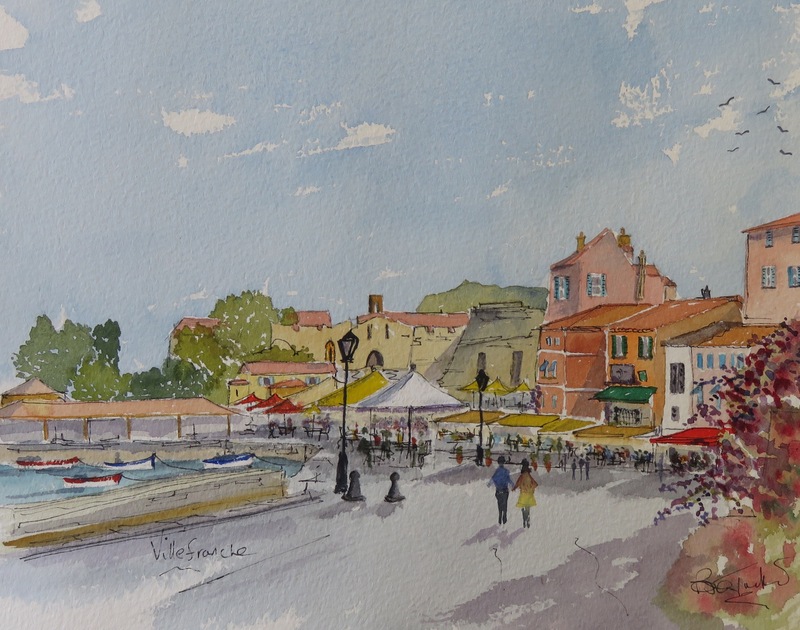 If you are on the Cote d’Azur then lunch on the Quai at Villefranche is a great way to start a holiday. Sitting in the sun at one of the restaurants by the quay is such a lovely experience. We really like “TRASTEVERE”, where the staff are great and the food excellent. This painting, from a photo taken that day serves as reminder of that lunch! By the Quai is the little Church decorated inside by Jean Cocteau, do spend some time there as it is a quite remarkable. In quiet moments I can sit and paint from reference photos and memories of other visits. This time was no exception and these three paintings come under that category. The little farm houses and the hills and fields of Provence are a constant inspiration in the bright and clear light of the landscape. 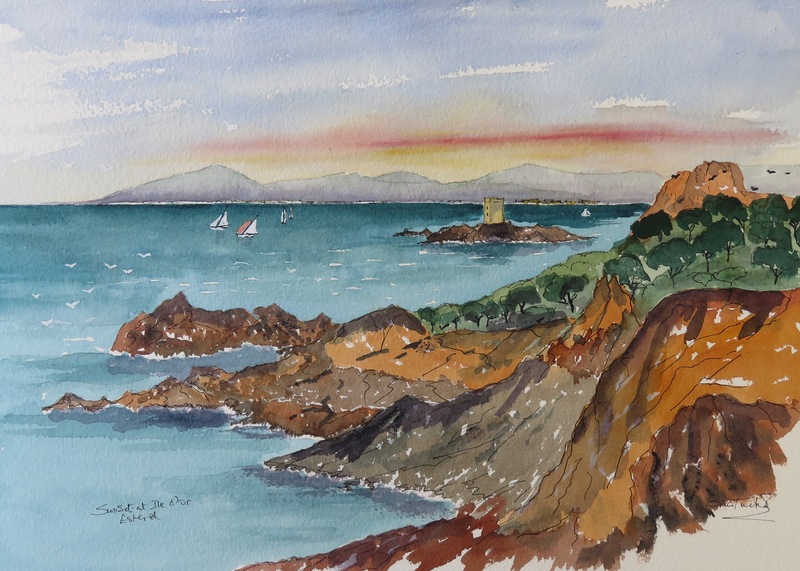 Here are two paintings of the Lavender and Vines of Haut Provence and one of the Iles d’Or, a tiny island with castle tower between Agay and St Raphael on the Esterel peninsula. 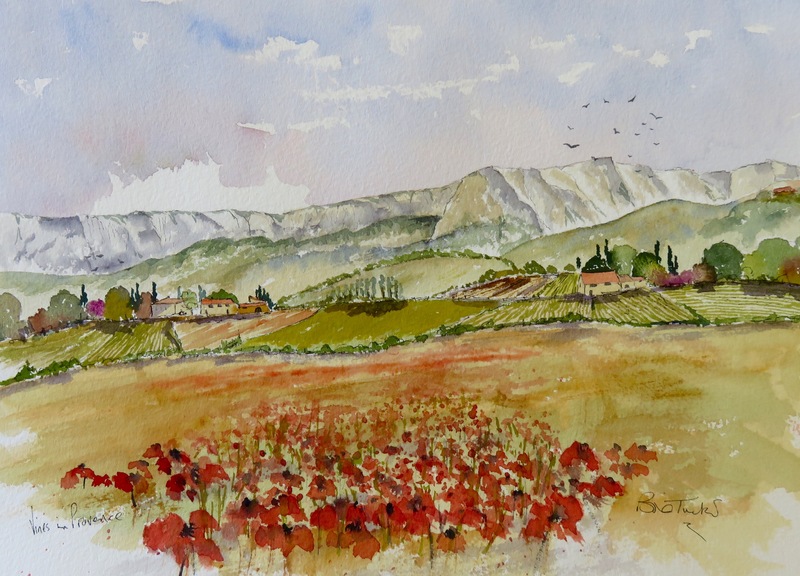 Vines and Poppies in Haut Provence. Watercolour 14 by 10 inches. Ile d’Or near St Raphael. Watercolour 14 by 10 inches. This week we had some friends staying with us and so we all took the ferry from St Maxime to St Tropez. The bustle of the main port and the huge yachts and boats is so contrasted by the calm as you walk round the corner to Porte de Peche and the view from the Tour Portalet, which is just at the Harbour. There are some good places to eat at “Le Ponche”, just 100 yards from the main harbour and the little port is delightful. Try the omelettes at “Le PeS Quiere”, really good! I love to paint this scene, so as well as the view from Tour Portalet I have included a previous painting of The Porte de Peche too. 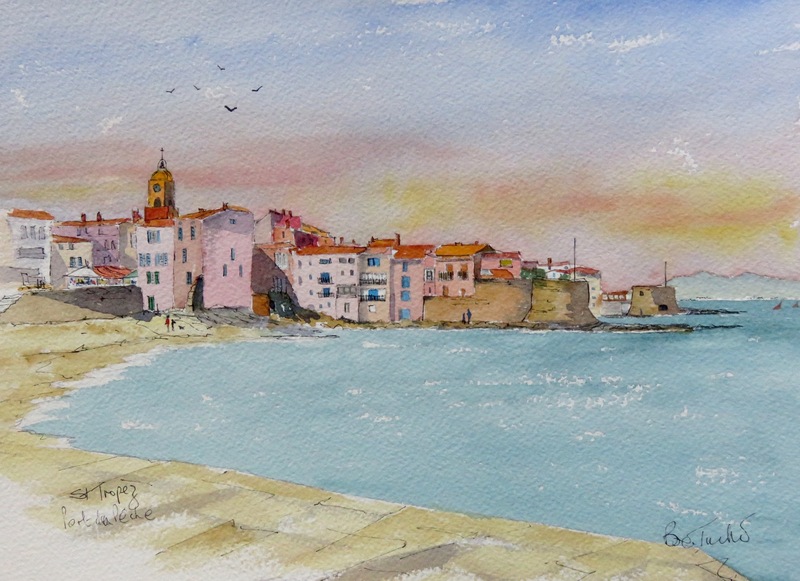 I hope you enjoy them and visit this quieter part of St. Tropez. Porte de Peche at St Tropez.